Yeah, but that looks like a third party cooler, not the stock one. From what I've heard it's unnecessarily louder than its 290 (without X) counterpart, especially at idle not significantly more quiet than the original cooler in quiet mode in idle. The Tri-X version in that picture is supposed to be about 4dB quieter at idle and 16-18dB quieter at load. It's only 2dB louder at load than the stock cooler is at idle. Pretty significant improvements. Edited by Deraldin, 19 January 2014 - 01:23 AM. I have no reference to the 290 (without X), but it is surprisingly silent. It is much, much quieter than my old dust-filled 5870 was, but that card was pretty loud. I haven't actually been able to make it go up in fan speed yet, at least that I have heard. Will need beefier games!! I have 8 fans all in all in my case, and at this point none of them stands out as the sound perpetrator. This is a good thing. Mantle drivers and patch for BF4 is now available for those who want to be guinea pigs. For old times sake perhaps, they missed their January release date by a day. Early reports showing worst-case 7-10% improvements for combinations of high end CPU + GPU, scaling up as either the CPU gets weaker (30%+ for a 290X paired with a Kaveri CPU for instance) or with the number of cards. Compared to the speculation perhaps some may be disappointed. Not industry-changing at this point, but then again people do pay hundreds of dollars for upgrades of similar magnitude, and this is free. The value, of course then, will be in how ubiquitous support ends up being. As I have neither Hawaii nor BF4 I'll hold off upgrading drivers for now. Is that the only reason to get 14.1 drivers ... Mantle. I have a Pitcairn card but a sheepish quad-core Llano and no BF4. I almost never get beta drivers anyway, but it's hard not to update just for the sake of updating. Tomb Raider is by far the most intensive game I have, so perhaps I'll wait to get Mantle until it's supported. I have a Hawaii and BF4 (came with the card), but the reports I've seen so far is making me hold off too. It really is a beta. I just upgraded to a 7850, and can run Crysys 3 no sweat. This thing is a beast. Three fans. Sheesh. It's so big I had to remove one of the harddrive cages to fit it in my case. Oh, and I also went out and bought a nice IPS screen with 2560x1440 resolution to try to stress this card. And I managed! I put everything on Ultra settings in Far Cry 3 with 8xMSAA at 2560x1440 and my poor card can only manage 30-40 fps. Oh yeah, I forgot about Far Cry. Maybe they'll add Mantle support for that game and my 7850 will do as well as a 270 does with DX11. 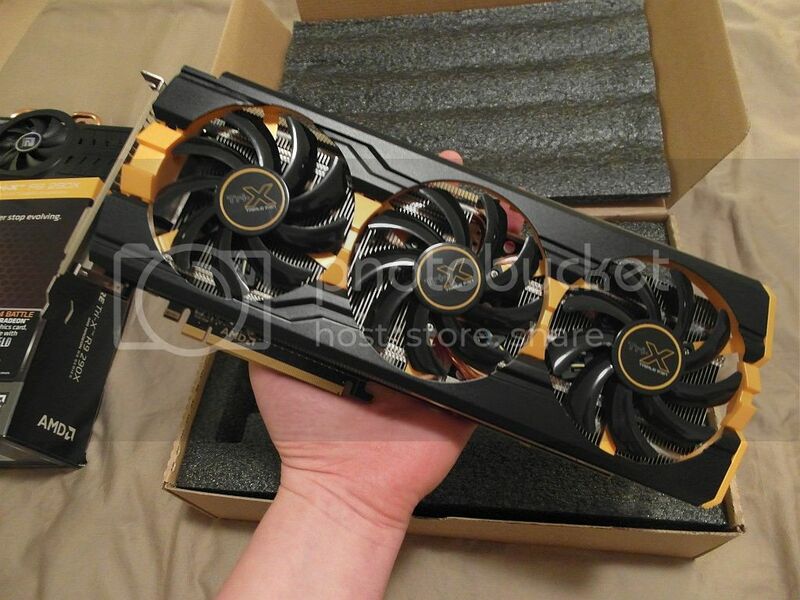 Really impressive card for the price, and runs super cool and quiet. AMD's drivers are also way, way better than they used to be, after having seen them last sometime around 2004. Edited by sea, 05 February 2014 - 03:53 PM. I had a fevered dream that I was taking my PC apart to stick a bunch of cool new stuff in it. I woke up a sad panda. So yeah, I'm starting to feel all jealous-like at threads like these, again. At least a year, maybe two before I can justify new rig/s. Wonder what gpu's will be like then. Progress isn't nearly as fast as it was early days, most of the current products bar the very fastest were release a full two years ago and perform pretty close to the halo products just released. So the answer to the question is "the same for most of the range, except the most expensive one will be maybe 30% faster." Can't say I particularly mind, though, leaves the cash available for more important things like storage. Dammit where are those 5TB drives we were promised last year? 290X hits $900! For the first time in my life I actually saved money by pre-ordering! As soon as I saw that Sapphire 290-review earlier in this thread, I pre-ordered my Sapphire 290X. Turns out that that was a good decision. I think I'll go buy a lotto ticket now. Never seen that before, either. Stupid coin miners are stupid. Never thought Newegg would go off like that. I have a hard enough time trying to get MSRP $19.99 for Star Wars Black Series figures. Amazon has had Boba Fett at +150% for months. Add Han Solo in carbonite and they're asking +600%. Desirability is expensive.